There are options and ideas beyond the traditional for every wedding decision you make. Most of these revolve around getting tasks done in unconventional ways. This may be by buying a product or service somewhere else besides a wedding vendor. Or you completing do-it-yourself (DIY) projects. You can also use items in less-than-usual ways. Or even skip a traditional part of the ceremony or reception. You can often save money along these less worn paths. 1. Shop non-wedding vendors, retailers, and online sellers for potential savings. 2. Make your own traditions or skip some entirely. 3. Selectively do it yourself. Choose projects if you have the resources and it makes financial sense for you to do so. 4. Think “beginning talent” when hiring vendors. 5. Choose less-expensive, non-traditional venues for your wedding and reception. 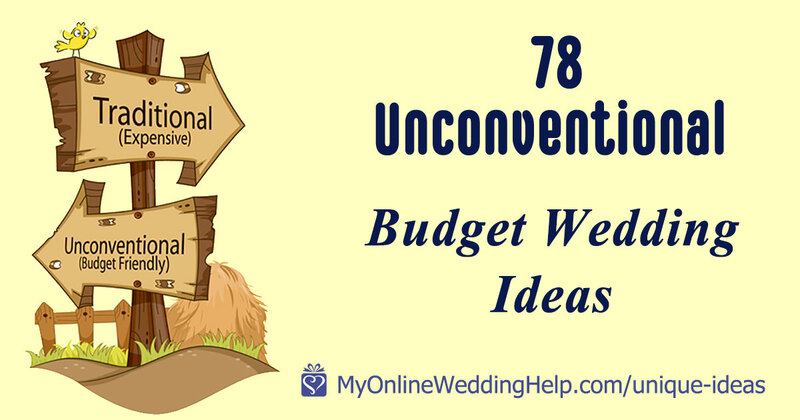 Brainstorm with our 76 non-traditional wedding venue ideas post. 6. Have a casual reception on a different day than the ceremony. 7. Ask a friend or family member to become ordained online specifically to perform your wedding. 8. Adjust ingredients if there’s a dish you particularly like but it’s out of your price range. 9. Hire a food truck. 10. Buy bulk, pre-made entrees and side dishes from a restaurant and pick up or have them delivered. 11. Have custom food stations consisting of relatively inexpensive ingredients. 12. Serve breakfast no matter what the time. 15. Buy and bring your own alcohol instead of using the venue’s. 16. Have an alcohol-free reception. 17. Ask folks to use whatever they are currently drinking for the toast. 18. Toast with a signature drink instead of champagne. 19. Serve a bubbly alternative for the toast. 20. Display several single layer cakes in place of a multi-tiered wedding cake. 21. Forego a traditional cake, and serve only dessert. 22. In lieu of a meal, put on an elaborate dessert spread complete with luscious coffee and chocolate drinks. 23. Have a dessert bar or interactive station instead of cake. 24. Use unexpected, inexpensive serving dishes. 25. If there is a dollar store near you, check there for glass containers. 26. Hire a student for editing video or pictures. 27. If you are going for an eclectic look, uncover finds at charity and thrift stores. 28. Save on cake by expanding your horizons beyond the wedding bakery. 29. Buy finished florals from nontraditional sources such as a warehouse club or online wholesaler. 30. Look into having photography or film students shoot your wedding. 31. Contact media photographers and cameramen to see if they moonlight at private events. 32. Give the flower girl and ring bearer handmade signs to carry down the aisle. 33. Make your own jewelry. 34. Order custom invitations online. Note: As with most My Online Wedding Help links, many of the links in this post go to the site’s shop section or to a merchant website. That said, THE CHOICES HERE ARE MY OWN. No one paid or asked to be listed here. My Online Wedding Help will receive a small commission from the merchant at no added cost to you if you click and buy a product. 35. Buy blank, printable invitations you can run through your home printer. 36. Order digital files online and print them at home or at a local printer to control costs and save shipment charges. 37. Send eInvites to the tech-savvy among your guests. 38. Make or buy guest book alternatives that can do double service as a table decoration. 39. Find budding photo and video professionals who want to break into the wedding industry. 40. Save on your make-up, hair and nails by contacting beauty academies, vocational schools, and training centers. 41. For lower-than-limo cost, consider vehicle alternatives. 42. Get a free makeover from a beauty consultant at a department or cosmetics store, then buy only the items you need. 43. Look for new groups to perform at the reception. 44. Consider top music students as wedding entertainment. 45. Make your rehearsal dinner an inexpensive activity. 46. Liberally use the Internet to find the best prices. 47. Exchange dog tags, necklaces, or other tokens of your love in lieu of rings during the ceremony. 48. Have your wedding certificate framed and hang it on the wall of your shared home instead of exchanging rings. 49. Wear tattooed wedding rings. 50. Expand the possibilities beyond “wedding” brands and stores. 51. Buy a “non-wedding” or bridesmaid dress to wear as the wedding gown. 52. Make the wedding dress yourself. 53. Allow the bridesmaids to choose their own, mismatched dresses, within guidelines. 54. Let the attendants shop for cocktail instead of bridesmaids’ dresses so each can wear hers again and again after the wedding. 55. Make a lightweight wrap or scarf instead of buying it. 56. Save money by skipping the tuxedos. 58. Make your own veil. You can watch my video series or read how to make your own bridal veil. 59. Let the flower girl and ring bearer’s parents choose the kids’ outfits, within certain guidelines. 60. Have someone make the flower girl’s dress and ring bearer’s suit or tuxedo. 61. Make and print the ceremony program yourself. 62. Make your own name cards. 63. Make your own menus. 64. Minimize the cost of flowers by using candles or other relatively inexpensive materials for centerpieces. 65. Create a mix-and-match, eclectic look with candlesticks and vases from dollar and thrift stores. 66. Use round paper lanterns or balloons as space fillers. 67. Create (instead of purchasing) backdrops to hang from the ceiling, window/door frames, or walls. 68. Use mirrors to make the room or decorations appear larger by placing under centerpieces or on walls. 69. Choose easy centerpiece styles and make them yourself. 70. Make strategic use of lights. 71. Decorate with tulle. You can get inexpensive tulle by the bolt here. 72. Add unexpected finishing touches to inexpensive table decorations. 73. Borrow the tables and seating. 74. Use hay bales as chairs or sofas. 75. Mix and match china and plates from thrift stores. 76. If yours is a less-than-formal affair, buy disposable cutlery, plates, glasses, and cups for economy and easy clean up. 77. Create your own favors. 78. 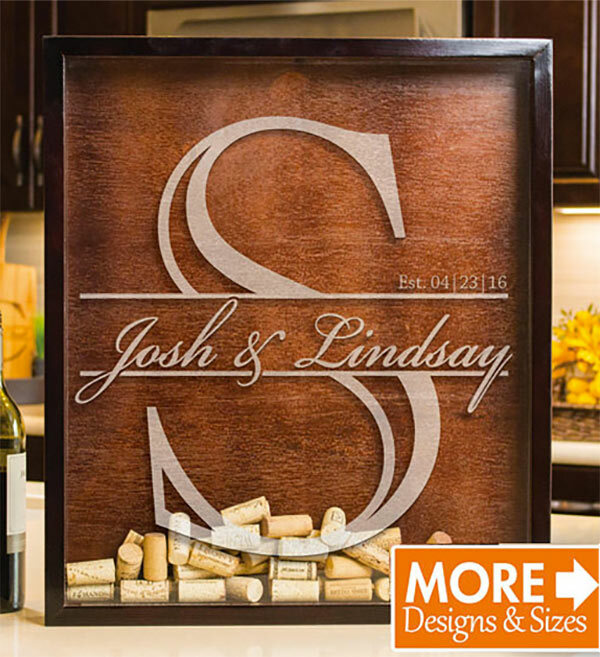 Put a special touch on wedding party gifts by making or personalizing them yourself.